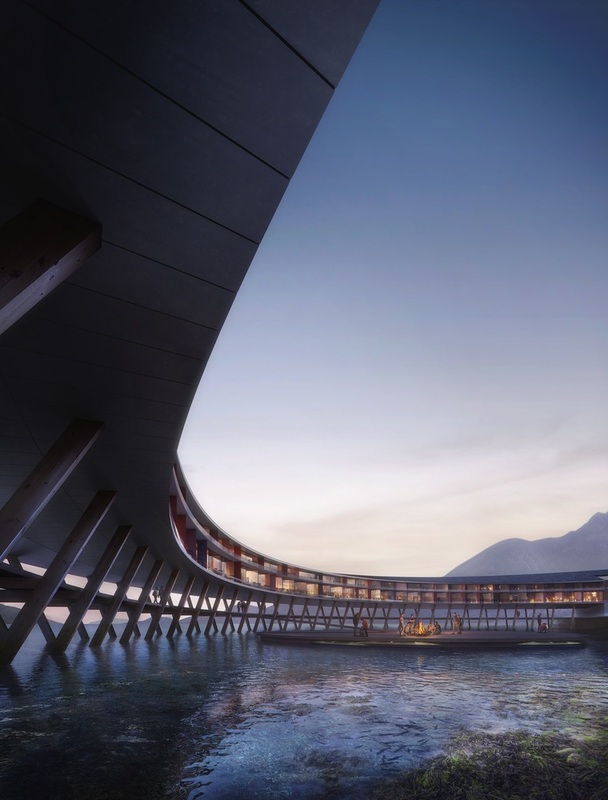 After tackling an underwater restaurant in the south of Norway late last year, Snøhetta has unveiled plans for a “floating” hotel in the country’s north. 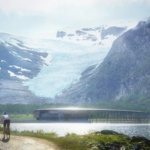 “Svart,” named after the adjacent Svartisen glacier, will produce more energy than it consumes thanks to the Arctic Circle’s 24 hours of sunlight during the summer months. 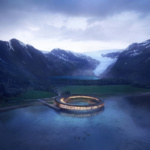 Reminiscent of the space-aged Apple Park doughnut, the ring-shaped Svart will rise from the waters of the Holandsfjorden fjord via crisscrossed timber columns and would provide guests with panoramic views of the lake and surrounding Almlifjellet mountain range. A round, wooden boardwalk will be suspended between the support struts and guests can stroll above the lake in the summer months; the path will be used for canoe storage in the winter, negating the need for an additional boathouse. 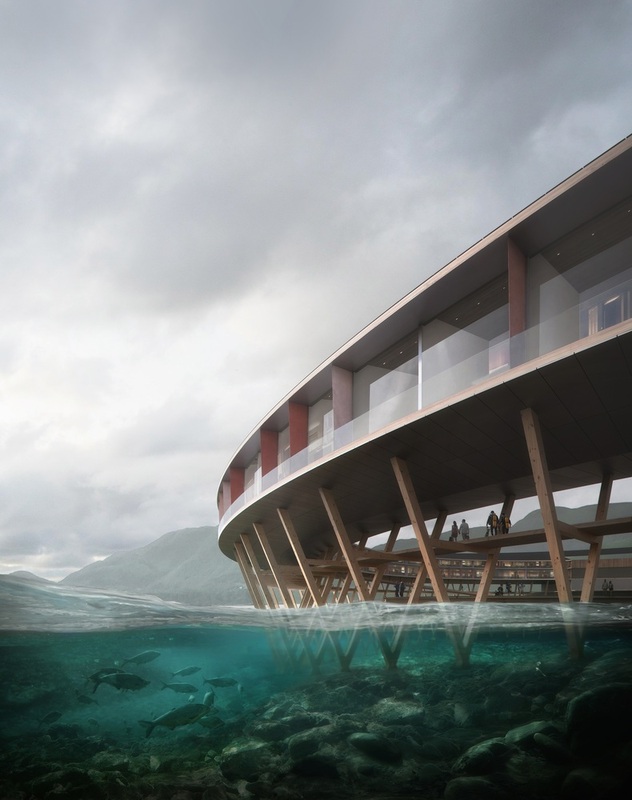 The circular construction references Norwegian vernacular architecture, and draws inspiration from both the “fiskehjell” (a wooden, A-shaped structure for drying fish) and the “rorbue” (a type of traditional seasonal house used by fishermen), as fishing poles informed the wooden support design. Wood panels will also be used to clad the hotel’s exterior. As part of preserving the fragile natural landscape around the hotel, Svart will generate all of its electricity on site. Meeting Powerhouse standards (a collaboration meant to stoke energy positive building construction) will be accomplished both through design as well as technology. 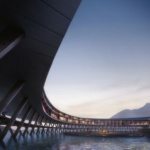 The hotel’s circular edge is rimmed with private terraces, which will set the building’s façade back and shade against solar insolation in the summertime, while the floor-to-ceiling windows will let sunlight passively heat the interior in the winter. The roof will be clad in locally produced solar panels, made with clean hydroelectric power, and the building will be constructed from materials with a “low embodied energy,” such as wood, meaning that a minimum amount of energy went into producing them. 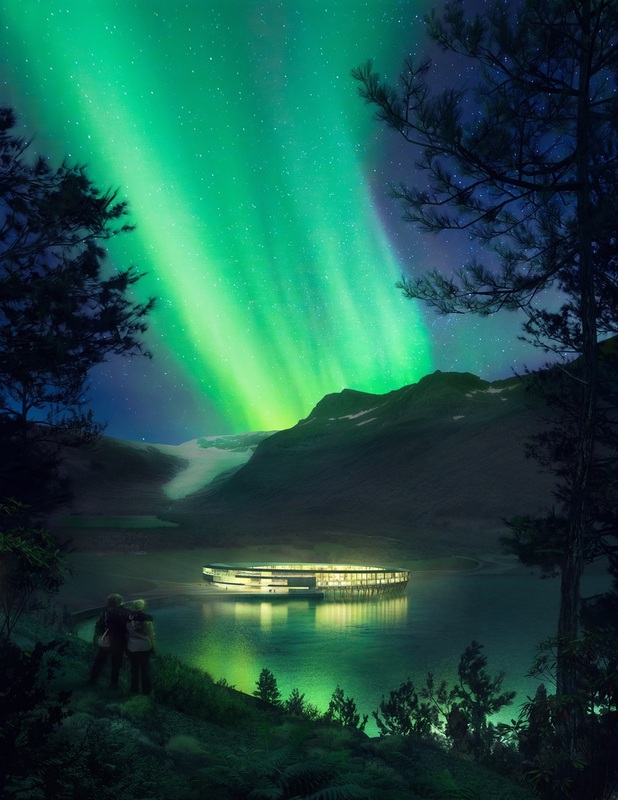 In designing the shape of the building’s roof, Snøhetta optimized the panels’ orientation to best take advantage of the “midnight sun” effect, where the sun never sets during the summer months in the Arctic Circle. Geothermal wells connected to heat pumps will warm the building in the colder months. 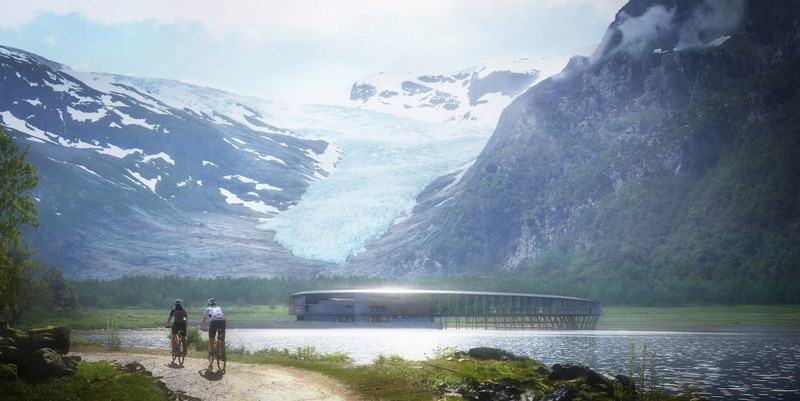 Altogether Snøhetta estimates that Svart will use up to 85 percent less energy than a hotel of comparable size. 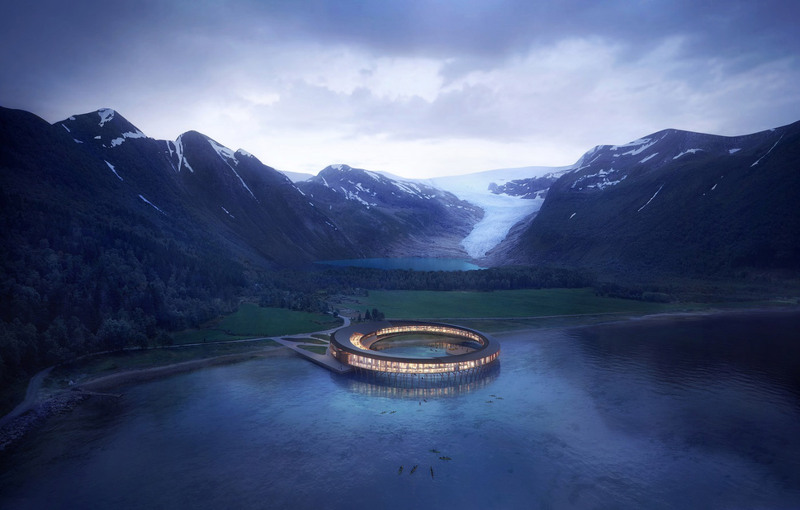 “Building an energy positive and low-impact hotel is an essential factor to create a sustainable tourist destination respecting the unique features of the plot; the rare plant species, the clean waters and the blue ice of the Svartisen glacier,” said Kjetil Trædal Thorsen, Founding Partner at Snøhetta, in a press release. Svart is being developed in collaboration with tourism company Arctic Adventure of Norway, consulting firm Asplan Viak, and Skanska. Together the four companies make up Powerhouse, a group dedicated to advancing the construction of “plus houses,” buildings that produce more energy than they consume over a 60-year period, including the usage of building and demolishing the structure. No estimated completion date has been given at the time of writing.